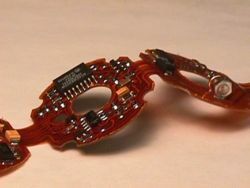 Quick Turn Flexible Circuits Designed and Manufactured by Flex Technology Inc.
Fast Flex PCB quotes —Send in your Gerber data to get a quick turn Flex PCB quote today. We are excited to become your Flex PCB partner. PCB Manufacturing —Flex Technology, Inc. does not provide bare board manufacturing. Please visit http://www.customcircuitboards.com/ for reliable quick turn PCB fabrication. Flex Technology, Inc. (FTI) understands the Customer. We know products must be delivered "on-time." We understand cost must be very competitive. We must be flexible, on schedule and, without question, provide "world class quality." FTI will aid in the design of your product, provide proof of design and deliver volume producton tailored to your unique stocking needs. Our company's success depends on satisfied customers. To achieve this success, our strategy demands an environment of excellence that goes beyond the expectations of our employees, our customers and our suppliers. FTI, with its partners has full assembly capabilities. This includes anything from a simple thru-hole connector to full surface mount technology (SMT). We can provide our customers with a complete turnkey package.